I've previously written about America's coming retirement crisis. But there's another crisis that isn't helping the situation... the student debt crisis. 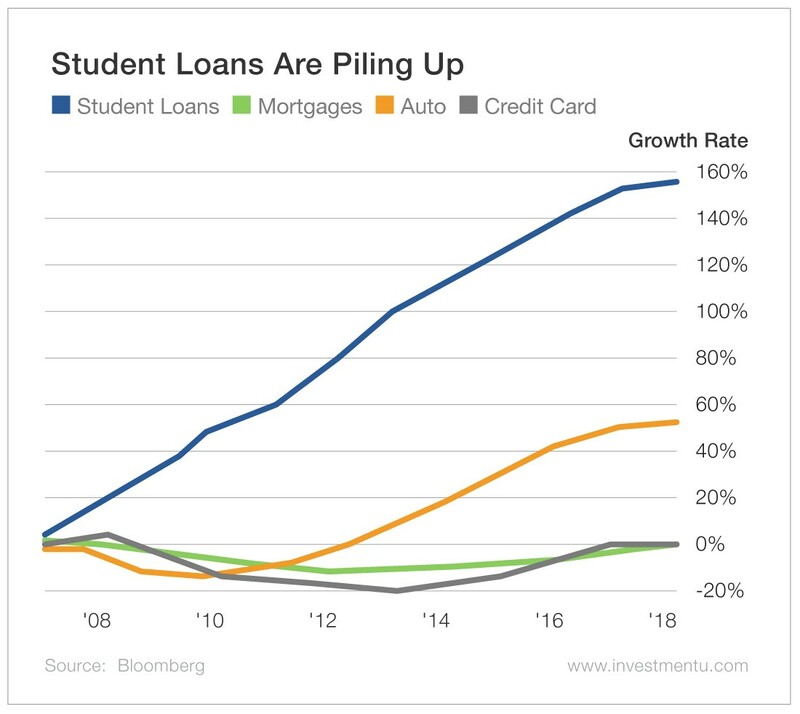 As more Americans attend college, student loans have grown by almost 160%. There's currently $1.5 trillion in federal student loans out there. The average student loan borrower is $37,172 in debt. Many owe more than that... Late fees and defaults often drive that debt up to six figures. It's gotten so bad that 40% of borrowers are expected to default on their loans by 2023. The average monthly payment on a student loan is $393. But some people pay as much as $3,000. Combine that with sky-high rent payments in many major cities and it's easy to see the dire straits many young people are in. This crisis is a ticking financial time bomb. The student loan crisis has made it much more difficult for young people to save for retirement. Similar to many boomers today, many won't have much (if anything) to draw on when they reach an age where they simply can't work anymore. This feeds into the retirement crisis. Many of the people who have less than $10,000 for retirement are millennials. They're the youngest and largest demographic in the workforce. It's not that they don't want to save. They simply can't. When they finally have to pay the piper, it'll be ugly. So there will be two crises feeding off one another. The only thing to do (before they ask you for money) is help your millennial children or grandchildren get their financial houses in order. This year's 21st Annual Investment U Conference in St. Petersburg, Florida, will offer a master class in financial literacy and investing. Our strategists, as well as experts from the world of finance, will be giving presentations on everything from stocks, bonds, options, commodities, currencies and gold to tangible assets, crypto and cannabis. We'll also have a special panel on financial literacy geared specifically toward helping you help the millennials in your life say "I can!" instead of "Can I?"